A recent article in Time Magazine highlights the current rise in rhino poaching and the increasing Asian demand and illegal trade which is driving the current crisis. Vietnam has rapidly emerged as the leading destination for illicit trade in rhino horn from 2003 onwards, as well as concerns over suspected rhino farming in China. Hustler and an animal pathologist begin the postmortem. The stench and the proliferation of flies and maggots indicate that the beast, which was found at the Shingalana private game reserve by a local guide, has been dead at least a week. Eight bullet cartridges are scattered near the carcass. Wearing white boots and blue latex gloves, the pair get to work, sharpening a series of butcher’s knives, then ripping into the rhino. A metal detector is passed over the exposed flesh. After an hour, the metal detector squeaks, then emits a louder shriek. The pathologist reaches the heart. “That’s the kill shot,” says Hustler, slicing the heart to uncover an inch-long slug. The South Africans rest and survey their grisly work. In 1993 international trade in rhino horn was banned by the Convention on International Trade in Endangered Species of Wild Flora and Fauna (CITES), which now includes 175 member countries and regions. But somewhere, almost assuredly on an illicit route to Asia, the horns and eyes of a 9-year-old female Diceros bicornis are traveling, destined for often desperate people who believe in the mystical curative powers of the rhinoceros. Unlike the elephant, its pachyderm cousin, the rhinoceros possesses little of the majesty needed to evoke worldwide sympathy. It is shy, low-slung, seriously nearsighted. It does not dazzle with its intelligence. Yet for millennia, these bulky lawn mowers have entranced humans with the agglutinated hair that makes up their horns. Ancient Arabs carved dagger handles from it; Yemen was a popular destination for the animal’s parts through the 1980s. Western colonialists in Asia and Africa lined their parlors with rhino-horn trophies and sometimes fashioned ashtrays out of the beasts’ feet. 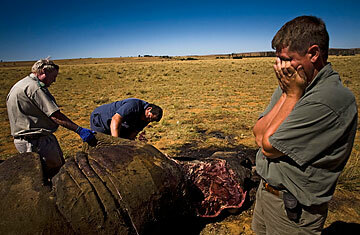 Most of all, though, rhino horn was prized in Asia for its purported medicinal value. Ancient traditional Chinese medicine texts recommended the powdered horn for ailments like fever and arthritis, and modern-day practitioners have prescribed it for high blood pressure and even cancer. (Common lore notwithstanding, rhino horn is not considered an aphrodisiac.) So treasured was rhino horn that some of China’s tributary states in Indochina were sometimes known in imperial shorthand as the lands of the rhino. This entry was posted in Rhinos, Wild Species and tagged Black Rhinos, endangered animal. Bookmark the permalink.